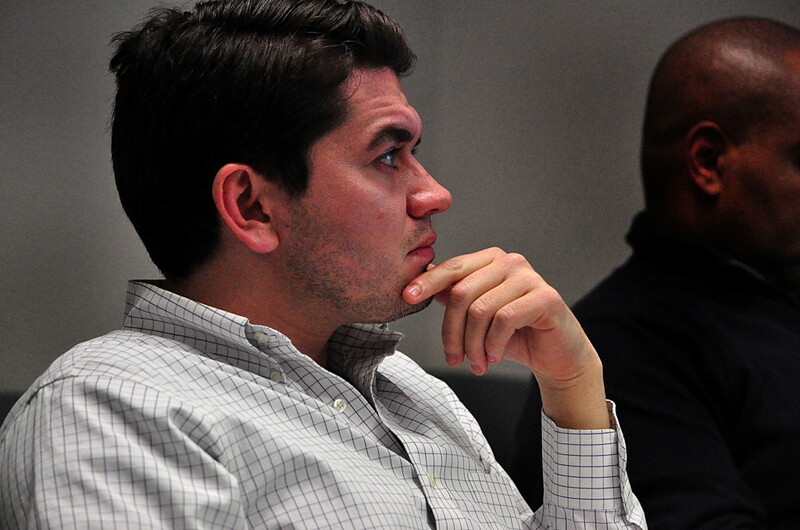 Norwalk Democratic mayoral hopeful Vinny Mangiacopra watched Finance Director Thomas Hamilton’s operating budget presentation at the Feb. 12 Board of Estimate and Taxation meeting. NORWALK, Conn. – One of Norwalk Mayor Richard Moccia’s attack phrases on his Democratic challenger in the last municipal election season won’t work this time around. “I’ve never seen him at a meeting,” Moccia said in 2011 of former Town Clerk Andy Garfunkel, indicating that Garfunkel didn’t have the knowledge he needed to run city government. Garfunkel, who has filed papers to again run for mayor, has been a regular attendee of Common Council meetings in the past few months, but he’s not the only Democratic Moccia-challenger who is looking in on how things work. District D Chairman Vinny Mangiacopra, who also has filed papers to run for mayor, attended the Board of Estimate and Taxation meeting on Feb. 11, studiously taking notes as Finance Director Thomas Hamilton presented his recommended operating budget. Wednesday night, former Norwalk Police Chief Harry Rilling — who hasn’t officially announced his intention to run for mayor — attended the first part of a superintendent search outreach meeting in City Hall before hustling upstairs to get to the Zoning Commission meeting, as he is a commissioner. “I think it’s good to hear what people have to say,” he said. Common Councilman Matt Miklave — who has formed an exploratory committee in advance of maybe joining the mayor’s race — attends more than his fair share of meetings, of course. So Moccia can’t use that line again. What do the Democrats think? Garfunkel didn’t return an email asking about the council meeting, but Mangiacopra had plenty to say about the BET and Norwalk’s budget. Miklave questioned whether the city is funding things the schools need or picking a number that works and then making the math fit that expectation. He added that this kind of review might have prevented the havoc that ensued last spring when the BOE discovered a $4 million shortfall. Mangiacopra was the only one of his announced competitors who returned an email looking for comment. “It’s a ton of words that says nothing about what he would do or what measures he has taken in all his time voting on budgets while on the council,” he said of the 429-word press release. What about that car tax issue? Moccia has been vocal this past week in his opposition to Gov. Dannel Malloy’s proposal to eliminate taxes on vehicles valued at less than $28,500 and to exempt the first $20,000 for those vehicles over $28,500. “If we don’t get the car tax we may as well shut the city down,” Moccia said to a colleague Tuesday before the BOE meeting started. Again, Mangiacopra was the only candidate who returned an email asking for comment. While Garfunkel didn’t respond directly to the email about car taxes, he did attack Moccia with a press release the following day. “It’s the mayor’s job, as our chief elected official, to work to improve the city, not just in the months leading up to an election, but every single day,” he said. “If Norwalk’s mayor had been doing this, he wouldn’t be left questioning how we will adequately fund our schools, or bemoaning the lack of growth in Norwalk’s grand list and shrinking state aid. Moccia is to blame, he said. I agree with Mr. Mikkave about ignoring 95% of the budget process. Public education needs to reinvent itself for the 21st Century. However, how does one restructure everything that hangs off of the classroom teacher, when the everything else is collectively bargained for and/or work rules have been set before the Stone Age or at least before technology could streamline them. Approximately 1/3 of the budget is for classroom teachers and the rest is for everything else. That’s a problem. The everything else is bankrupting us. Job descriptions need to be rewritten. New positions identified and others eliminated. Bring it on Mr. Miklave, I’d love to hear yours and Mr. Ditrio’s ideas. What we have in Norwalk is not sustainable. Surely there are economies that could be found if the City and the BoE got together on some common problems. Both need insurance, for example. Both purchase quantities of similar products. One purchasing agent, chasing the best values, could save a lot. It could be done without either side giving up control of what they need to control. Now the BoE runs a seperate government, for all practical purposes, funded by the City. There are ways to get better value for taxpayer dollars. If Mr. Miklave thinks the process is broken, where is his solution? What would he do differently? Break state law and the charter? When he is mayor, is he going to give the council line item control of the budget? It’s easy to criticize, harder to manage, and much harder still to actually improve things. We see the way Mr. Miklave goes. Whatever happened to the concept of zero-based budgeting? Or at least examining all discretionary spending. Regarding comments about the BOE $4M shortfall, I think this problem resulted from not having a Financial Director for several years. The blame for this should be shared equally by both parties. All of a sudden, little Vinny is a budget expert? Andy blames the Mayor for a stagnant grand list? This is too much . Tell you what, guys. Blame Miklave for delaying 95/7 all through the years when financing money was easy. That screwed up the grand list big-time. Amazing anything pro Moccia LWitherspoon thinks is excellent..